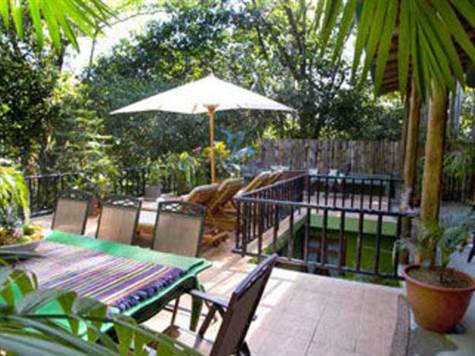 This beautiful luxury villa, located in the heart of Manuel Antonio, has everything you can wish for. Inside the villa, there are 10 bedrooms which provide enough space for about 26 people, all of the rooms are fully furnitured, decorated and have air-conditioning. In two of the 10 bathrooms are private Jacuzzis, a perfect spot to relax after a long day. Six rooms are situated in the main house and the remaining rooms in an unattached guest house with a private bathroom. The unique interior design of the house, including teak trimmings and 25-foot vaulted ceilings, brings the jungle experience inside your luxury home. On the lower level there is a large room for games and freetime activities, it is equipped with a full size pool table, a football table and also a nature-style indoor plunge pool with a water feature, which fits perfectly to the jungle view, that surrounds it once you open the big glass doors. The modern kitchen, built according to american standards, is located on the ground floor and part of the main living area. A kitchen bar and dining table for 8 people give you enough space to have a dinner party with your friends and enjoy the stunning view of the ocean and the outside area with the pool. Outside the villa are two outdoor areas: On one side you can enjoy ocean views from the pool or relax in the seating furniture, which bring the comfort of a living room outside, on the other side you can admire the view of the costa rican jungle and it's animals.